This product is no longer available. Please see the OM-SQ2040 as a possible alternative or contact our Data Acquisition Engineering department. You need to monitor the temperature of a process across a wide range and be immediately notified any time, day or night, if the temperature goes out of specified limits. The OMA-VM520 will make a telephone call to up to four phone numbers or pagers to notify key personnel of a temperature problem. Call anytime and hear the temperature of any sensor. The OMA-VM520 is a full featured temperature alarm system capable of making alert telephone calls when the temperature goes outside of a user specified range. The OMA-VM520 monitors up to four (4) K-type thermocouple temperature sensors, one (1) dry contact alarm input, and power. The OMA-VM520 has programmable high and low temperature limits and an alarm time delay for each sensor. An identification message can be recorded for each sensor, indicating where the sensor is located to allow a quick response to a problem. The OMA-VM520 has numerous options that allow it to be configured for any application. The OMA-VM520 can monitor any switch, relay, or dry contact with its dedicated dry contact input. A time delay can be programmed, enabling a contact to be closed a maximum amount of time before the buzzer is activated and the OMA-VM520 begins its alarm procedures. The OMA-VM520 will turn on the alarm relay and buzzer and begin making emergency notification calls when the temperature of any sensor is out of limits for greater than the alarm time delay or if the dry contact input is active. 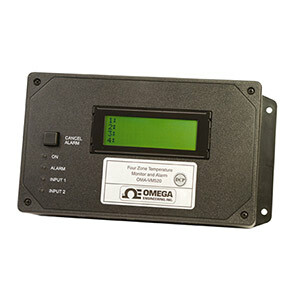 The OMA-VM520 with Ethernet Data Collection Package is also a full featured temperature monitor and temperature data logger that can store temperature readings on a computer. Do you need to keep temperature records? Using the Ethernet Data Collection Package with the complimentary Data Capture Program enables you to store your temperature readings indefinitely on your computer and analyze and work with your data. The Ethernet Data Collection Package version (OMA-VM520-DCP) allows you to collect data across your LAN and store readings on PC. Also, alert emails can be sent out to alert staff to temperature issues. A built-in web server allows you to use a simple web browser to check the temperature by entering the IP address of the device into a web browser. 참고: Comes with complete operator’s manual and AC adaptor.